June 11, 2008 – Forty-four years ago, on June 12, 1964, Nelson Mandela and seven of his comrades were jailed for life in what became known as the Rivonia Trial. Mr Mandela, Ahmed Kathrada, Walter Sisulu, Elias Motsoaledi, Andrew Mlangeni, Govan Mbeki, Raymond Mhlaba and Denis Goldberg were convicted of sabotage on June 11 by Judge Quartus de Wet. The next day, all but Denis Goldberg, who was the only white person convicted in the case, were shackled and flown to Robben Island Maximum Security Prison. Because apartheid rules applied also to prisoners, he was held in Pretoria Central Prison, where he spent the next 21 years. As they entered the court room at the Palace of Justice in Pretoria on June 12, 1964, all the accused were prepared to be sentenced to death. Mr Mandela, who on November 7, 1962 had been sentenced to five years in prison, was already a Robben Island prisoner when his comrades were arrested at Liliesleaf Farm in the Johannesburg suburb of Rivonia. Mr Mandela himself had been underground since April 1961, and had travelled to the United Kingdom and to other African countries without an official passport. He was arrested on August 5, 1962 in Howick, KwaZulu-Natal. His five-year sentence was for leaving the country illegally and for inciting workers to strike. He used his speech from the dock in the Rivonia Trial to outline the history of racial oppression in South Africa and to explain how the African National Congress had tried every available method of peaceful protest before deciding to turn to the armed struggle. Mr Mandela was held on Robben Island until March 1982, when he was moved to Pollsmoor Prison in Cape Town. In 1988, when he contracted tuberculosis, he was treated at Tygerberg Hospital in Bellville and then at Constantiaberg Medi-Clinic until he was moved to Victor Verster Prison in Paarl. 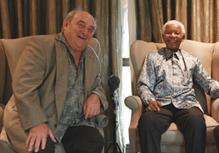 Denis Goldberg was released in 1985, Govan Mbeki in 1987 and the rest of his comrades in 1989. Just over three months later, on February 11, 1990, Mr Mandela walked through the gates of Victor Verster Prison. Of the Rivonia eight, only Mr Mandela, Mr Goldberg, Mr Kathrada and Mr Mlangeni are still alive.